I don't even know how to start this blog but here it goes. It started on Tuesday with having lots of pressure and pain in my tummy. I stuck it out all day to get my last minute errands done and by 10pm I couldn't take the pain anymore so I called my doctor. He suggested that I take tylenol and unisom to help the pain and to get one last good night sleep. That is what I did and I am so glad I took his advice! It was 4am before we knew it and we were on our way to the hospital. It was a really weird feeling leaving the house as just the two of us and knowing there would be one more person when we returned. We were admitted and checked into the labor and delivery room by 6am. I was hooked up to pitocin at 6:30am and really had no clue what to expect. Chris and I had a nice quiet time until 7:30am when my doctor walked in singing and said "ok, its time to break your water." I looked at Chris with a panicked look on my face and could see the panic in his. Break my water already?! I was not ready for that but it obviously had to be done for progress to be made. All I can say is I am soo thankful that my water didn't break while I was out shopping. There was no turning back now! Right after my doctor did that he held hands with Chris and I and prayed for Kate, Chris and I. It was so special and a moment we will never forget. As soon as he broke my water the contractions started. I did really well until I got to a 4 and ordered the epidural right away. The anaesthesiologist came in and had Chris leave the room. (warning #1) I sat on the edge of the bed and draped my arms around my nurse and did all of the breathing exercises that I learned in lamaze. They definitely helped! (I'm going to fast forward a bit....) an hour and 15 minutes and 9 attempts to place the epidural later, I finally had relief. Yes, it took the man 9 attempts to place it. I can't even begin to describe how miserable I was between that and trying to breath through the contractions I was having (and having to stay completely still). It was so stressful and all I wanted was my husband. I stayed calm until the 7th try when I laid my head on my nurses shoulder and just cried. Once the epidural was in I felt like a new woman. I had 4 hours of being pain free and was able to rest and relax a little bit. It was wonderful!! 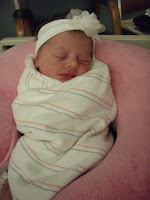 By the time the epidural started wearing off I was at an 8 and I started feeling pressure. The next hour and a half were pretty intense as she was dropping down lower and lower. Not to mention I was throwing up non-stop from my heartburn and pain. I went from an 8 to a 10 in an hour and was ready to push. I pushed for about 30 minutes and kept wondering where my doctor was. Chris had one leg and my nurse had the other. I kept thinking, "who is going to catch this baby?!" Little did I know I still had a bit of pushing to do before the Dr. would come in. Once he finally came in I knew it was getting close. The pain and pressure was SO intense. I laid there quietly in between pushing and cried out to the Lord to help me get though it. My mom kept reminding me that Jesus was right there with me and was going to get me through it. Chris would tell me how great I was doing and my Doctor kept encouraging me to push hard. There was a point when I honestly didn't know how I was going to get her out. Before I knew it I did one last push and out came Kate. Happy Birthday princess! 6 pounds 8 ounces and 19.5 inches long born at 3:36pm! My doctor laid her on my stomach and Chris cut the cord and she was exercising those lungs! It was absolute love at first sight and such a surreal moment to finally have her in my arms. Every single one of our prayers had been answered. 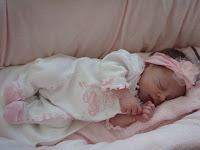 Chris and I had our snuggle/ skin on skin time with her for the first hour of her life which was precious. We laid there and just stared at her and took in all her little features. She is definitely her daddy's girl, his mini me! I could go on and on about our first night together and life now but it's time I tend to our precious angel. All I can say is we had no clue how amazing parenthood would be. We are soo in love with our precious Kate and are taking in every single second. The Lord is so good. We never realized the miracle of life until we met Kate. I don't know how anyone can say there is no God. He knit her together perfectly. Chris and I have never been happier or more in love. Kate has blessed our life and made us complete. Thank you Jesus!! !